I still remember the first time I tried chimichurri sauce. 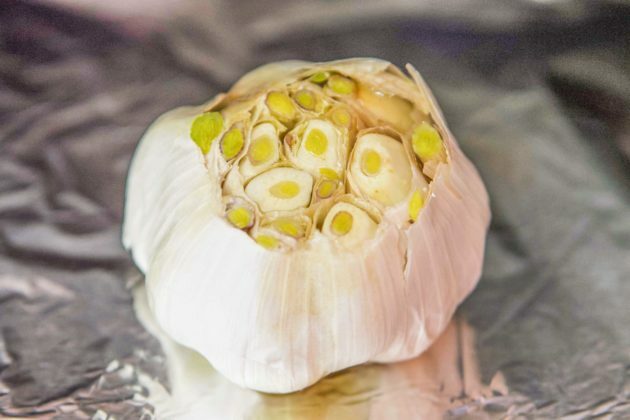 Talk about an explosion of flavor in one tiny bite! My sister-in-law, Alison, brought some over once during one of our cooking adventures. Alison is such an amazing cook. I love the time we get to spend in the kitchen, doing what we best, cooking unforgettable meals. I remember Scott liked it so much, he dumped the entire contents of the jar over his dinner. We were both hooked after that night! 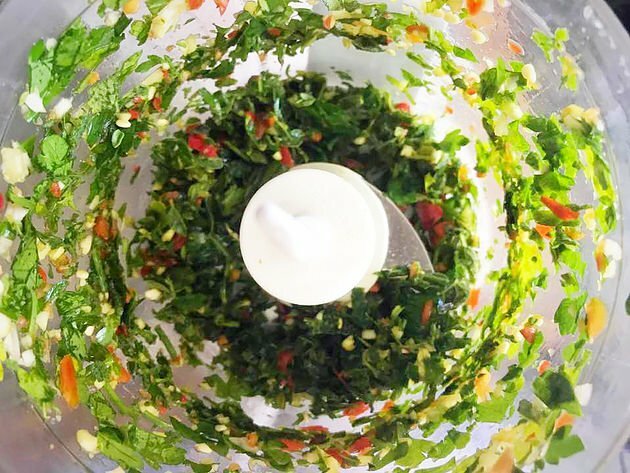 Chimichurri is a spicy Argentinian sauce, made with fresh ingredients like Italian parsley, oregano, garlic, and chilis. Think pesto, with ten times the flavor and kick! But don’t let the simple ingredients used in this recipe fool you, this is no ordinary sauce. 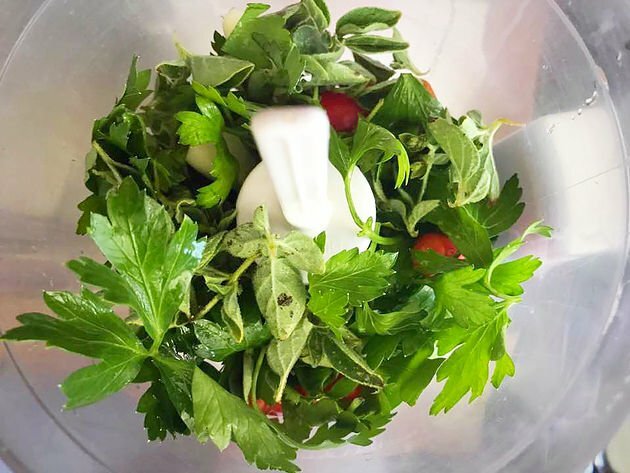 Speaking of ingredients, I’ve found that other herbs work great in this recipe too! 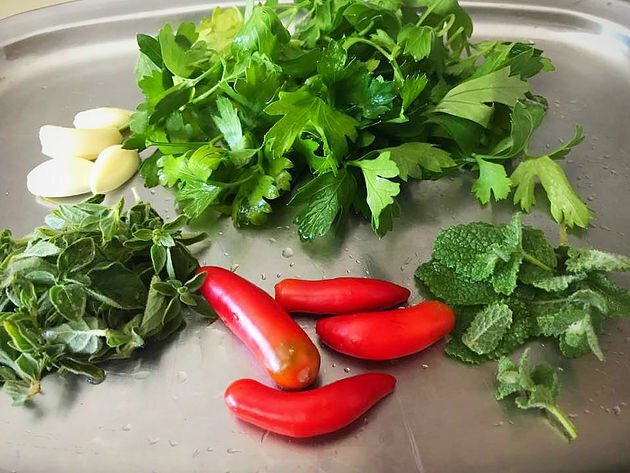 Mint and cilantro are some great examples. I have also added shallots and scallions with great results. So as always, have fun customizing this recipe by adding ingredients that you are fond of. sauce; all you need is some great crusty bread to serve with it. 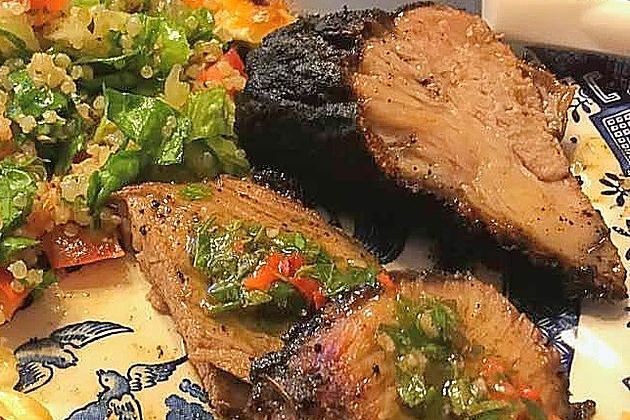 My personal favorite way to serve chimichurri is with Santa Maria tri-tip; talk about a great combo! Earlier in the post, I compared chimichurri to pesto, so it should come as no surprise that chimichurri sauce can be used in similar ways. Simply stir it in some pasta, like you would with any other sauce. I have also used chimichurri sauce instead of pizza sauce to make home-made chicken pizza. Speaking of chicken, this sauce would go great over my barbecued sumac chicken. Truly, the possibilities are endless! It’s so good, you’ll be tempted to pour it over everything! 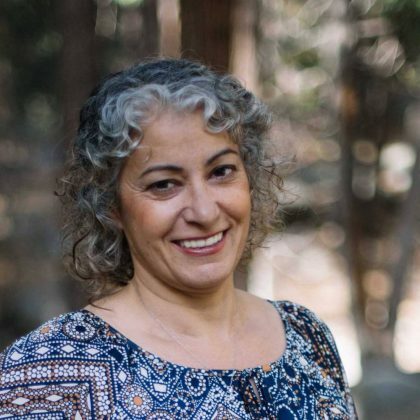 For other great recipes, check out the following posts: Tahini Sauce, Honey Mustard Sauce, Enchilada Sauce, and Tomatillo Salsa. An Argentinian fresh herb sauce served with grilled meats, or as a dipping sauce. Add parsley, garlic, oregano, mint, and serranos to the food processor and pulse until chunky. Add the next four ingredients and pulse a few more seconds. Empty the contents of the food processor into a measuring cup. Slowly drizzle in the olive oil and stir to combine. 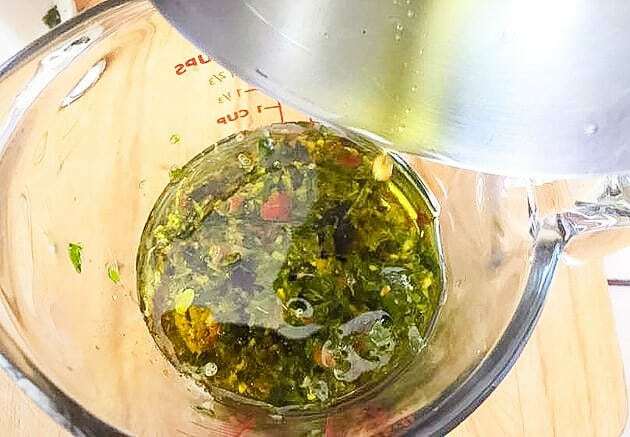 Pour the chimichurri sauce into a jar, then seal and store in the fridge until ready to use. Be sure to bring the sauce to room temperature before serving.